Abhijit Vinayak Banerjee was educated at the University of Calcutta, Jawaharlal Nehru University and Harvard University, where he received his Ph.D in 1988. 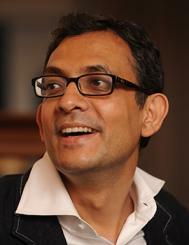 He is currently the Ford Foundation International Professor of Economics at the Massachusetts Institute of Technology. In 2003 he founded the Abdul Latif Jameel Poverty Action Lab (J-PAL), along with Esther Duflo and Sendhil Mullainathan and remains one of the directors of the lab. In 2009 J-PAL won the BBVA Foundation "Frontier of Knowledge" award in the development cooperation category. Banerjee is a past president of the Bureau for the Research in the Economic Analysis of Development, a Research Associate of the NBER, a CEPR research fellow, International Research Fellow of the Kiel Institute, a fellow of the American Academy of Arts and Sciences and the Econometric Society and has been a Guggenheim Fellow and an Alfred P. Sloan Fellow. J-PAL received the inaugural BBVA Frontiers of Knowledge Award for world-class research, and Professor Banerjee received the Infosys Prize 2009 in Social Sciences and Economics. In 2011, he was named one of Foreign Policy magazine's top 100 global thinkers. His areas of research are development economics and economic theory. Banerjee is a member of J-PAL's Executive Committee and previously served as co-chair of J-PAL’s Education Sector. He is the author of a large number of articles and three books, including Poor Economics which won the Goldman Sachs Business Book of the Year. He is the editor of a fourth book, and he finished his first documentary film, "The Name of the Disease," in 2006. Most recently, Banerjee served on the U.N. Secretary-General’s High-level Panel of Eminent Persons on the Post-2015 Development Agenda. Basic income could transform society. But first, it needs to be tested. Eradicating poverty is a "moving target"
Video: Is entrepreneurship among the poor a way to growth? N Chandra Mohan: Reign of the one per cent? Has Poverty Really Dropped in India? Will Entrepreneurs Save the World? Abhijit Banerjee: "A classe média não quer ser rica"